Galuwa means ‘to climb’ in Gadigal language and that’s exactly what we want Aboriginal and Torres Strait Islander high school students to do at UTS. The Galuwa Experience is a fantastic chance for young Indigenous high school students to discover the opportunities a degree in engineering, IT, health, science and visual communication and animation can provide. The 3-day program attracts students who are interested in the fields of business. The free program features interactive hands-on workshops, site visits with industry partners, cultural activities, information about career paths and lunch. Participants also hear inspirational talks from Indigenous and non-Indigenous students, cadets and professionals. Who is this for? 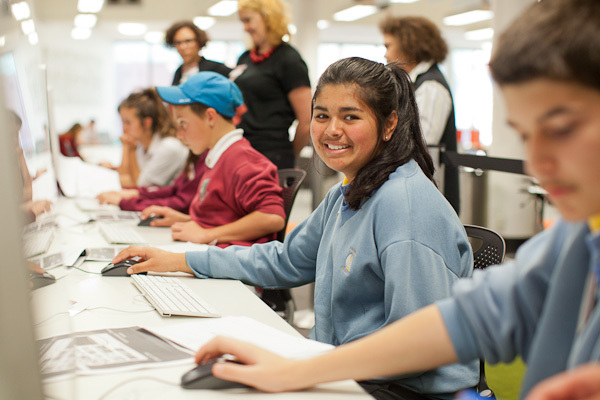 Aboriginal and Torres Strait Islander students in years 9–12. How much does it cost? FREE (Includes all meals, transport and accommodation). Where is it being held? University of Technology Sydney city campus. When should I register? Registrations are not yet open for the Business Science Experience. Express interest in attending the UTS Business Experience. The 5-day program attracts students who are interested in the fields of engineering or IT, as well as those who naturally have an aptitude for maths, creative thinking and problem solving and are unsure of which career path to follow. The free program features interactive hands-on workshops, site visits with industry partners, cultural activities, information about career paths and lunch. Participants also hear inspirational talks from Indigenous and non-Indigenous students, cadets and professionals. When should I register? Applications are now open – apply online! Applications close on 2 June 2019!!! The 3-day program attracts students who are interested in the fields of nursing, midwifery and sport and exercise science. The free program features interactive hands-on workshops, site visits with industry partners, cultural activities, information about career paths and lunch. Participants also hear inspirational talks from Indigenous and non-Indigenous students, cadets and professionals. When should I register? Registrations are not yet open for the Galuwa Health Experience. Express interest in attending the UTS Galuwa Health Experience. The program attracts students from the Northern Territory who are interested in university study. The free program features interactive hands-on workshops, site visits with industry partners, cultural activities, information about career paths and lunch. Participants also hear inspirational talks from Indigenous and non-Indigenous students, cadets and professionals. Who is this for? Aboriginal and Torres Strait Islander students currently studying in years 9–12 in the Northern Territory (NT. When should I register? Registrations are not yet open for the Galuwa Experience. Express interest in attending the UTS Galuwa Experience. The 3-day program attracts students who are interested in the fields of mathematics and science. The free program features interactive hands-on workshops, site visits with industry partners, cultural activities, information about career paths and lunch. Participants also hear inspirational talks from Indigenous and non-Indigenous students, cadets and professionals. When should I register? Registrations are not yet open for the Galuwa Science Experience. Express interest in attending the UTS Galuwa Science Experience. © Copyright UTS - CRICOS Provider No: 00099F - 19 March 2019 10:14 AM. The page is authorised by Deputy Vice-Chancellor and Vice-President (Corporate Services).